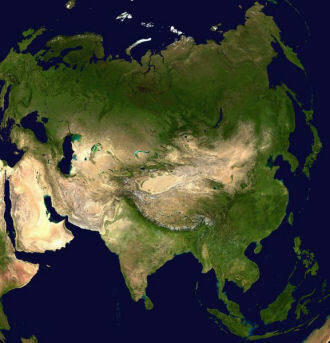 Background: Asia, the world's largest continent, 17,139,000 sq mi (44,390,000 sq km). with about 3.3 billion people, nearly three fifths of the world's total population. Location: This refers to a location somewhere in either the Asian continent or in the Pacific Ocean, or somewhere in the Pacific Rim that is otherwise unspecified. Climate and Terrain: The Pacific Ocean encompasses a third of the Earth's surface, having an area of (69.4 million sq mi), significantly larger than Earth's entire landmass, with room for another Africa to spare. The western limit of the ocean is often placed at the Strait of Malacca. The lowest point on earth, the Mariana Trench, lies 10,911 metres (35,797 ft) below sea level. Its average depth is 4,300 metres (14,000 ft). The Pacific Ocean contains about 25,000 islands (more than the total number in the rest of the world's oceans combined), the majority of which are found south of the equator. Asia falls into the following major physiographic structures: the northern lowlands covering W central Asia and most of Siberia; the vast central highland zone of high plateaus, rising to c.15,000 ft (4,570 m) in Tibet in China and enclosed by some of the world's greatest mountain ranges (the Himalayas, the Karakorum, the Kunlun, the Tian Shan, and the Hindu Kush); the southern peninsular plateaus of India and Arabia, merging, respectively, into the Ganges and Tigris-Euphrates plains; and the lowlands of E Asia, especially in China, which are separated by mountain spurs of the central highland zone. Mt. Everest (29,035 ft/8,850 m), in Nepal, is the world's highest peak; the Dead Sea (1,312 ft/400 m below sea level) is the world's lowest point. People: This area contains about 3.3 billion people, nearly three fifths of the world's total population. Almost two thirds of Asia's indigenous population is of Mongolic stock. Major religions are Hinduism (in India); Theravada Buddhism (in Sri Lanka, Myanmar, Thailand, Cambodia, Vietnam, and Laos); Lamaism, or Tibetan Buddhism (in Mongolia and China, particularly Tibet); East Asian Buddhism (in China and Korea, mixed with Confucianism, shamanism, and Taoism; in Japan mixed with Shinto and Confucianism); Islam (in SW and S Asia, W central Asia, and Indonesia); and Catholicism (in the Philippines, East Timor, and Vietnam). Economy overview: Subsistence hunting and fishing economies prevail in the forest regions of N and S Asia, and nomadic pastoralism in the central and southwestern regions, while industrial complexes and intensive rice cultivation are found in the coastal plains and rivers of S and E Asia. Because of extremes in climate and topography, less than 10% of Asia is under cultivation. Rice, by far the most important food crop, is grown for local consumption in the heavily populated countries (e.g., China, India, Indonesia, Bangladesh, and Japan), while countries with smaller populations (Thailand, Vietnam, and Pakistan) are generally rice exporters. Other important crops are wheat, soybeans, peanuts, sugarcane, cotton, jute, silk, rubber, tea, and coconuts.